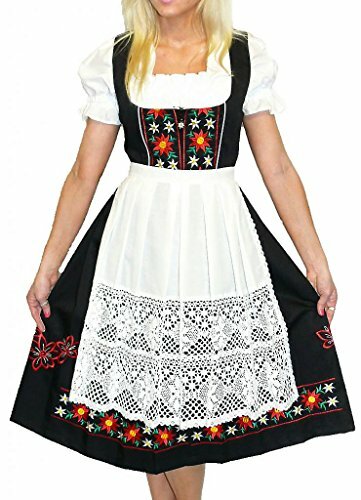 Dirndl Trachten Haus 3-Piece Long German Wear Party Oktoberfest Waitress Dress 20 50 Black | What Should I Say? Truly Stunning! This Gorgeous Long Black Dirndl Has Embroidery Throughout The Bust Area And Around The Base. The best way to measure for a good fit is to measure around the fullest area of your bust with just your bra on and measure around the smallest part of your waist area. Then take those two measurements and compare to the size chart to find your size. The Material is a High Quality And Sturdy Cotton Blend. Measurements: Bust: 47" Waist: 41" Total Length: 45" Length From Waist Down: 27". Each Dirndl Purchase Includes The Beautiful White Lace Apron And Crop Top Blouse. If you have any questions about this product by Dirndl Trachten Haus, contact us by completing and submitting the form below. If you are looking for a specif part number, please include it with your message. Real Black LEATHER ROMAN GLADIATOR SET MENS UNIFORM LARP GOTH STEAMPUNK - (WAR1) Waist 32" Chest 38"